Seriously? OMG! WTF?Jane Fonda Archives - Seriously? OMG! WTF? Lily Tomlin and Jane Fonda sat down for Wired and answered the Web’s Most Searched Questions. We did not learn anything new about them, just that they are so good at playing off of each other. I love Grace & Frankie and I know it has another season after this upcoming one. But I wish Netflix would give them a show where they just answer our questions. I would binge that over and over again. Deadpool 2 and Book Club are both coming out on Friday, but everyone is focused on the movie with Ryan Reynolds in it. Well, the ladies have a message for him and they want him know they are just as good as him. That and they want to go all Fifty Shades of Grey with the DILF. Even Mrs. Ted Danson who played his mom in The Proposal. 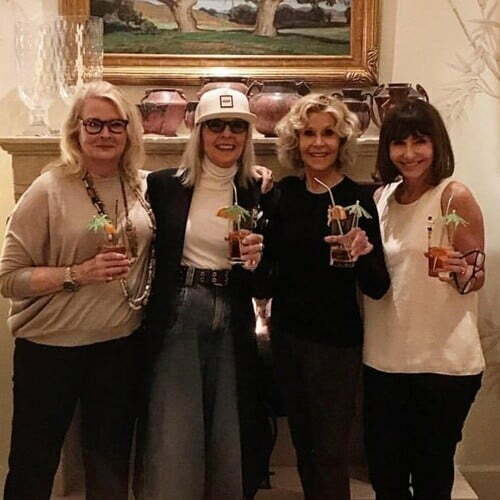 Can you blame Mary Steenburgen, Candice Bergen, Diane Keaton and Jane Fonda? He is a hot piece of a life-size red condom. I cannot wait to see how Deadpool responds to the Anastasia Steele wannabes. You know it will be naughty, just how they all like it! BTW what does it say about me that I would rather see Book Club over Deadpool 2? Is Jane Fonda really 80 years old? Jane Fonda wowed at the Oscars in a white Balmain gown, and that was just from the front. From behind, her behind was an Oscar winner. She has curves that woman a 1/4th of her age would love to have. Which makes you wonder if she is really 80 years old? Since she is, we also should consider doing the Jane Fonda workout to get a body like hers because it obviously works. Look at her! Hubba, hubba. Grace and Frankie is back for its fourth season on Netflix now for you to stream all 13 episodes and this might be the best season yet. There is love, new life, death, family and most importantly laughs! The season starts off with Frankie (Lily Tomlin) still living in Santa Fe with Jacob (Ernie Hudson), but she needs to fly back to LA to go to Bud (Baron Vaughn) and Allison’s (Lindsey Kraft) baby reveal party. When she gets to the house, she shared with Grace (Jane Fonda), her former roommate found a new one to live with her. Sheree (Lisa Kudrow), Grace’s manicurist, is the complete opposite of Frankie, so of course she hates her. Frankie will do everything in her power to get rid of Grace’s new BFF, but that is proving harder than she thought. Until they find something to bond over. Talking about bonding, Robert (Martin Sheen) and Sol (Sam Waterston) are not. Their marriage is in trouble as Robert gets more involved with the plays he is doing. Sol wants to protest more, but his husband is too busy to do it. Things are so bad between them, they decide to go to a therapist who tells them to see other people. Will they do it? This season, Frankie is healthier, but Grace is not. Her knee is giving her problems and it is becoming harder for her to get around. Because of that it makes her feel old. So old, she thinks that she needs to break up with her boy toy Nick (Peter Gallagher) because of it. When he refuses, she decides to show him her real face to see if he still wants her. In a revealing scene, she takes off all of her makeup and we get to see what a bare faces Fonda looks like. Will he stay with her? With all of that they still have time to sell their vibrators, deliver a baby, commit a few crimes, break up with their lovees and still be there for each other when they really need it. And they are going to need it. Especially since one of them is dead. The whole season comes together with an ending that sets up for the fifth season they better get. This show might have an older cast, and people of all ages can enjoy. I have been watching a lot of Golden Globe winners and they have all been disappointing me. Then I watched all 13 episodes of this season and I was reminded that television can be great. It can also leave you feeling happy. The chemistry of this cast grabs hold of you and never lets you go. That is why before you know it, you have binged all 13 episodes and you cannot wait for the next season to premiere. Which they better be filming as you read this.